Disclosure: I received complimentary products to facilitate this post. All opinions are my own. Take a peek with Peek-a-Bear is Jill Weisfeld cleverly designed children's book filled with colorful imagery and playful rhyming prose that takes you on an exciting interactive adventure with the character Peek-a-Bear. It is the first of a series of "Peek & Play" books. 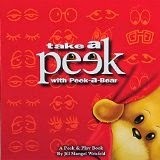 Little kids love playing peek-a-boo and this book is a great way to incorporate that since of discovery. Each page has new things to find - and then the last page brings them all back together for kids to discover. The animations are charming and the simple writing is perfect for little kids.